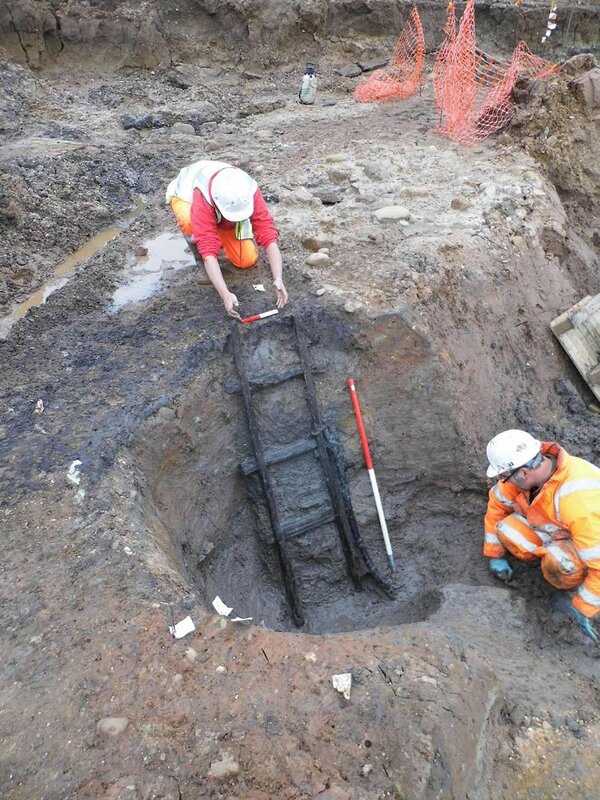 Archaeologist record a preserved wooden ladder at Brooksby. As the year comes to an end Patrick Clay (co-director) looks back at the highlights for ULAS during the year. Some have already featured in our blog, others we will take a closer look at in the new year. The overwhelming impression of this year has been that it has been the busiest in over five years as the construction industry picked up and the need for archaeological work increased. We have undertaken more projects and covered a wider geographical span with 42% of our work being outside Leicestershire. While much of our work has been in connection with residential development we have also seen an increase in work at gravel quarries. Taking us through the archaeology of the year chronologically: at Brooksby, research into the Bytham river deposits continued with the much delayed drilling program over the buried Palaeolithic river channel. The lower Palaeolithic implements from the site have now passed 500. Twenty years ago the total for the whole county stood at 5! Moving into the Later Upper Palaeolithic, further work has taken place on the Creswellian flint scatter first discovered by Graham and Christine Commbs at Bradgate Park back in 2000/1. There have been many broken piercers/borers which, together with several burins, are probably remnants of an antler workshop. Further, more extensive, excavation is to take place in 2015. 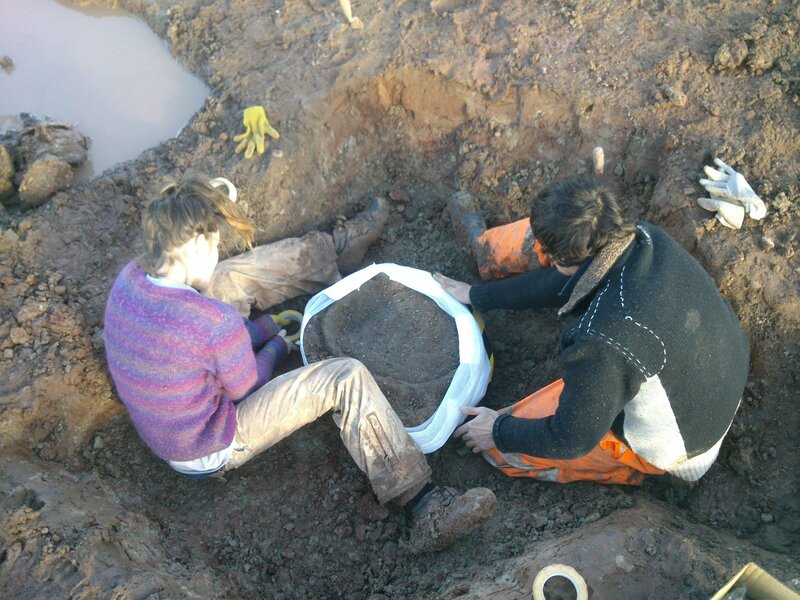 Archaeologists lift an Iron Age cauldron at Kirby Muxloe. Later prehistory has been well represented this year, with excavations of Iron Age settlements taking place at Kirby Muxloe, Oakham, Market Harborough, Pineham North, Mowmacre and Aston Clinton. Kirby Muxloe in particular is of note with its unique metalwork finds including 8 composite cauldrons, a sword and parts of a possible scepter (more on the site next year). The fifth and final season of excavation took place at Burrough Hill Iron Age Hillfort, completing a remarkably successful field-school program highlighted by the chariot fittings currently on display in Melton Carnegie Museum. LiDAR survey in Charnwood has located previously unknown later prehistoric earthworks including some in Bradgate Park, which is to be the location of the new field-school from 2015. Interested visitors gather to inspect archaeologist working on the blocking wall across the western entrance of Burrough Hill hillfort. 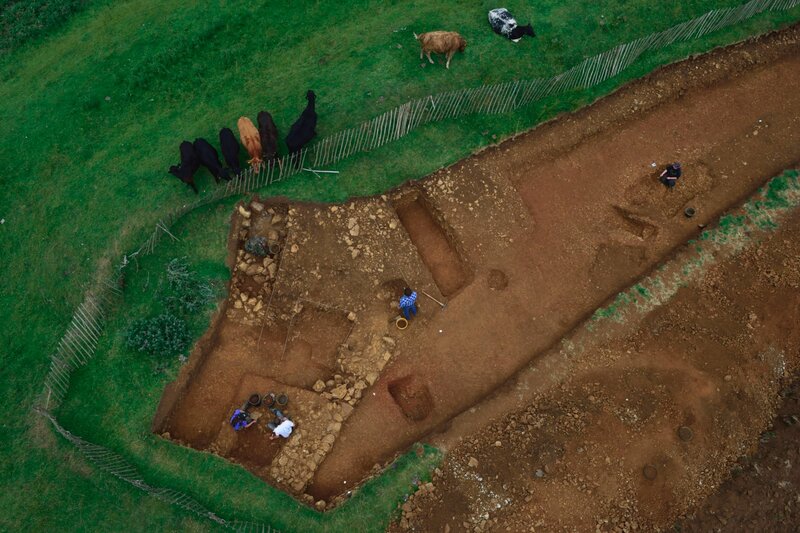 Archaeologists excavate an Iron Age four-post structure at Aston Clinton. Roman discoveries included the discovery of a lost section of the Icknield Way and roadside settlement at Aston Clinton and further evidence from Highcross Street, Leicester. At Brooksby, a remarkable well preserved ladder is paralleled by Roman examples from Glastonbury lake village, although we await radiocarbon dates to confirm this. From the medieval period, the joint ULAS and Hallaton Fieldwork Group project at St Morrel’s chapel had another successful season. In addition to more burials, a pilgrim badge dedicated to St Morrel was discovered. The LiDAR survey at Bradgate Park located medieval settlement features which will be the subject of further work for the 2015 field-school. In Leicester, excavation on De Montfort University’s campus has uncovered a lengthy section of the 15th century Newarke Wall. The Grey Friars project has seen further papers on the analysis of the skeleton of Richard III published, culminating in the DNA analysis by the scientific team led by Dr Turi King. ULAS has continued to provide numerous talks on the project and has had a total audience reach of over 8,000 since the discovery. In July the visitor center was opened and plans are in place for the re-burial of the king in Leicester Cathedral in March 2015. Finally, our historic buildings team has undertaken numerous surveys over the year, ranging from Preston Hall in Rutland to the Towers mental hospital and a Great Central Railway engine shed in Leicester. Merry Christmas everyone and we’ll be back with more news in the New Year!